Good Friday is the most solemn day of the church year on which all Christian faithful reflect upon the crucifixion of Jesus Christ on the cross, His death and burial. In the Byzantine Catholic Church, Good Friday is memorialized penitentially as a day of strict fast, prayer, and solemnity closing with an evening Vespers service. While secular culture has diminished the obligation to make the day different than any other for the general public, businesses, and most workers, the Church encourages the faithful to hold to some forms of traditional reverence on this day. This includes as much as possible keeping the day holy and prayerful, and attending afternoon or evening services. While not obligatory for the faithful, attending Good Friday Vespers is in essence keeping vigil with the Mother of God, all the apostles and saints, in humble gratitude for the immense sacrifice that Jesus made for our sins and for our redemption. Attendance at Good Friday Vespers is strongly encouraged as a visible expression of our personal repentance and feelings of sorrow on this day. 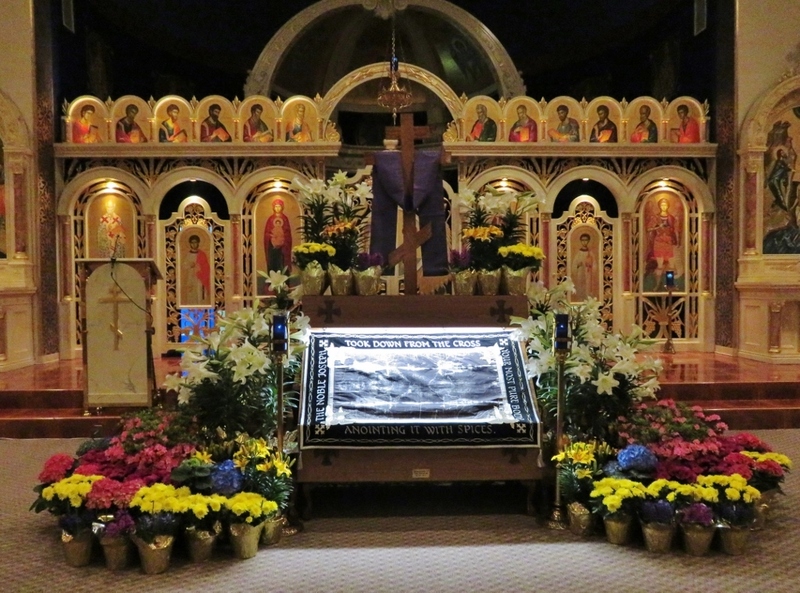 Good Friday Vespers is a service of chanted verses, Scripture readings, and prayers culminating with the customary procession with the Holy Shroud (Plashchanitsa) representing the burial of Christ in the tomb. The congregation joins in the procession and all sing a hymn (words below) as the priest, carrying the Shroud represents the role of Joseph of Arimathea. The Shroud is placed in a symbolic tomb located in the front center nave of the church. This is a powerful visual reminder making very clear this sorrowful period of time – the waiting period between Christ’s death and discovery of his resurrection from the tomb. Following the final incensing and conclusion of the service, the clergy, altar servers and parishioners venerate the Holy Shroud as a quiet gesture of showing respect to Our Lord and Savior in His burial. An old tradition in the Byzantine church is witnessing the faithful humbly approaching the Shroud on their knees and this is done as a small sacrifice by comparison to all that Christ did for all humanity. The presence of the Shroud and period of solemnity during which Christ rests in the tomb remains in effect until the Holy Saturday Matins announcement of the joyful news – the finding of the empty tomb and Christ’s triumphant Resurrection. During this interval between Christ’s burial and Resurrection, the faithful are reminded to continue to maintain an attitude of holiness and piety in their routine activities. A rare event occurs when the Feast of the Annunciation falls on Good Friday, as was the case in 2005 and again in 2016. The next time this will occur will not be until 2157! In the Byzantine church, when this synchronicity occurs, Divine Liturgy is celebrated first, followed immediately by the Good Friday Vespers service with the Holy Shroud procession. This is the only time Divine Liturgy and Holy Communion are allowed on Good Friday. The reason for this exception is with the significance of the great Feast of the Annunciation, the moment when through the power of the Holy Spirit, the “Word became Flesh” in the womb of Mary. The conjunction of the two events on our liturgical “earthly”calendar, Annunciation and Good Friday, serves to highlight the wonder and mystery of all that God does in “heavenly time” in His great love for us. Of course, based on the next time this will happen on the liturgical calendar, we will only have our vague memory of having witnessed it during our lifetime. 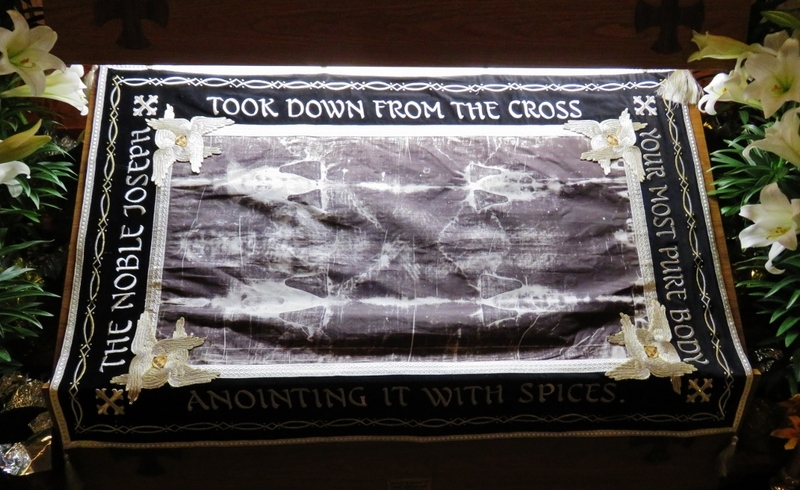 St. Michael’s, Pittston is privileged to have a replica image of the Shroud of Turin as the church burial shroud. The Shroud of Turin is an image of a crucified man transposed on a large piece of folded cloth in such a way that can only be described as miraculous. This image has been extensively researched using scientific technology. The research results are so compelling, and with so many irrefutable parallels to Christ’s crucifixion, that the image is believed to be the actual burial cloth of Jesus. We welcome you to prayerfully join us for services and vigil on Good Friday. The noble Joseph took down your most pure body from the cross. and with fragrant spices laid it in a new tomb.